Blue-eyed, brown-haired Collette recently played Rose Feller in 2005’s In Her Shoes, alongside Cameron Diaz and Shirley Maclaine. She will soon complete the upcoming films The Night Listener, Little Miss Sunshine and Like Minds. Rumors also spread that Collette will leave the movie set and go down the road next year with an album of alternative rock, pop songs. On a more personal note, the 5' 6" tall actress was linked to actor Jonathan Rhys Meyers. She is currently the wife of musician Dave Galafassi. The eldest child to parents Bob Collette (truck driver) and Judy Collette (customer-service representative), Antonia Collette was born on November 1, 1972, in Sydney, New South Wales, Australia. She was raised in Blacktown, a suburb of Sydney, Australia and attended the National Institute of Dramatic Art, in Sydney, for 18 months. On January 11, 2003, Toni Collette tied the knot with musician Dave Galafassi. In her off time, Collette likes to go on mental and spiritual retreats in India. The vegetarian actress also does yoga and has climbed the Tibetan Himalayas. She has homes in Australia and the Republic of Ireland. 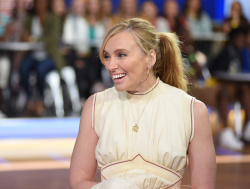 14-year-old Toni Collette began performing on stage in a school production of "Godspell." Two years later, she dropped school to pursue an acting career and worked with the Australian Theatre for Young People. After briefly attending the prestigious National Institute of Dramatic Art, Collette went to work with the Sydney stage, where she appeared in several stage plays. Collette made her feature acting debut in an Australian comedy directed by Mark Joffe, Spotswood (1992, The Efficiency Expert, starring Anthony Hopkins and Ben Mendelsohn). She also appeared in the Australian TV series "G.P." and "A Country Practice," and played the lead role of Sonya in the Sydney Theatre Company's 1992 Production of Anton Chekhov's "Uncle Vanya." 1994 was Collette’s breakout year. After starring in Kelli Simpson's 19-minute film This Marching Girl Thing, Collette gathered worldwide attention for her title role in writer-director P.J. Hogan's hit, the dark comedy Muriel's Wedding. In the film, Collette had to gain 40 pounds to play the overweight, ABBA-worshipping Aussie woman who obsessed over her wedding day. The film became a sleeper hit in both Australia and the USA and Collette’s brilliant performance earned rave reviews. She won Best Actress awards at the Australian Film Institute (the Australian equivalent of the Academy Award), Australian Film and Television Award and Film Critics Circle of Australia. She was also nominated for Best Performance by an Actress in a Motion Picture - Comedy/Musical at the Golden Globes. The next year Collette portrayed the young version of a woman who had been locked up in for 40 years by her loveless father (Barry Otto), in the Australian film Lilian's Story (Ruth Cracknell played the older title role). Collette strong performance in Jerzy Domaradzki’s adaptation of Kate Grenville’s novel, gave her the second Australian Film Institute award, this time for Best Actress in a Supporting Role. More roles followed. Collette provided her voice to the 1995 animated movie Arabian Knight and played roles in 1996's Cosi, and The Pallbearer. She then costarred as Harriet, the shy friend of Gwyneth Paltrow’s character, in Douglas McGrath's romantic comedy inspired by Jane Austen's novel, Emma. She followed it up with such roles as a wallflower in Jill Sprecher's poignant office comedy Clockwatchers (with Lisa Kudrow, Parker Posey and Alanna Ubach), an obsessive detective in Mike Barker's crime comedy The James Gang, and an Australian who won a trip to London in David Parker's romantic comedy Diana & Me. The rest of the 1990s watched Collette played the wife of a glamorous rocker (played by Jonathan Rhys Meyers) in Todd Haynes' retro movie Velvet Goldmine and take home another Australian Film Institute award for her strong supporting turn in Rowan Woods’ Aussie crime flick, based on Gordon Graham's play, The Boys (opposite David Wenham). After appearing in Peter Greenaway's 8 1/2 Women, Collette entered the Hollywood mainstream with her Academy Award-nominated role as the mother of a psychic child (Haley Joel Osment) in writer-director M. Night Shyamalan's chilling psychological thriller The Sixth Sense (alongside Bruce Willis and Haley Joel Osment). In the new millennium, Collette made her Broadway debut as Queenie in the musical "The Wild Party," by Michael John LaChiusa and George C Wolfe, where she received a Tony nomination for Best Actress in a Musical. Back to the screen, Collette appeared in John Singleton's remake of Ernest Tidyman's novel, Shaft (starring Samuel L. Jackson), played a role in Hotel Splendide and lent her voice to The Magic Pudding. She also joined Dennis Quaid, Greg Kinnear and Andie MacDowell in the HBO adaptation of Donald Margulies' Pulitzer-winning play, Dinner With Friends, costarring as Beth, a woman who separated from her husband after 12 years of marriage. Collette reunited with Samuel L. Jackson in Roger Michell's Changing Lanes (also with Ben Affleck) and played the BAFTA-nominated role of a struggling single mother, opposite Hugh Grant, in the Weitz brothers' adaptation of Nick Hornby's popular British novel, About a Boy (both in 2002). That same year, Collette was given a role in Stephen Daldry's film version of Michael Cunningham's Pulitzer Prize-winning novel, The Hours (with Meryl Streep, Julianne Moore, Nicole Kidman and Ed Harris). She also costarred with Bryan Brown in writer-director David Caesar's gangster movie Dirty Deeds. In 2003, Collette won a Best Actor - Female with the Film Critics Circle of Australia Awards for her divergent performance as geologist Sandy Edwards in Sue Brooks' drama film Japanese Story (opposite Gotaro Tsunashima). After sharing the starring roles with Nia Vardalos (as two struggling Chicago dinner theater performers) in Michael Lembeck's comedy Connie and Carla (2004, also with X-File star David Duchovny), Collette played a conceited and scheming English starlet in Jeff Nathanson's ensemble comedy The Last Shot (with Matthew Broderick and Alec Baldwin). More recent, Collette’s fans could watch Collette starred as Rose, a high-powered lawyer and the head-on-straight older sister of Cameron Diaz’ character, in director-producer Curtis Hanson's big screen version of the book by Jennifer Weiner, the drama comedy In Her Shoes (2005, also with Shirley MacLaine). Commenting on her role in the film, Collette, who had to gain and lose 25 pounds (11.3 kilograms), said, "I vowed to the high heavens that I would never put on weight again for a movie, but (director) Curtis Hanson has this way of getting what he wants and I ended up putting on 25 pounds to play the part. Then, once Rose, my character, becomes a happier person it affects her physically so I then had to lose the weight through a rigid diet and exercise program during the middle of shooting. I don't think I'll be doing this weight see-saw thing again." Collette will add to her acting resume such upcoming films as Patrick Stettner's thriller The Night Listener (costarring with Robin Williams) and Jonathan Dayton and Valerie Faris' comedy Little Miss Sunshine (with Steve Carell and Greg Kinnear). She will also star as a forensic psychologist in writer-director Gregory J. Read's crime drama Like Minds (alongside Eddie Redmayne and Tom Sturridge).